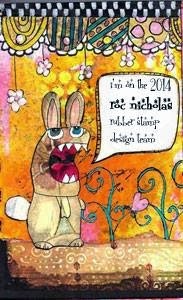 I'm thrilled to announce that I have been selected to be a part of the Roc Nicholas Rubber Stamp Design Team beginning 1/1/14! 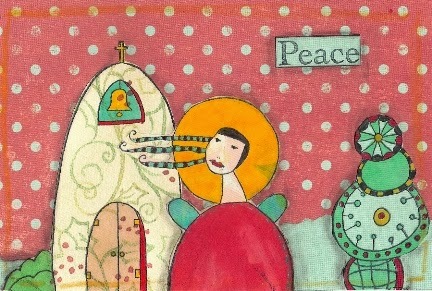 I am very honored, and I'm looking forward to working more with her whimsical rubber stamps. I think they are adorable, and they tug on my heart. Be sure to join the Roc Nicholas Rubber Stamp group on facebook. Not only will you be able to see what others are creating with Roc's Rubber Stamps, but hopefully you'll join in the fun. Happy New Year! Live creatively! Three of Roc Nicholas Rubber Stamps were used on the postcard shown above. From left to right: Little Church, Roc's Angel, and Steampunk Border. I also used those same three rubber stamps to create ornaments that were given away as part of this blog's grand opening. so happy to have you on the team!! i can't wait to see how you interpret my stamp images! LOVE it! I still think the angel painting of yours needs to be made into Christmas cards. I will buy them if you do. Congrats! the angel painting was sold and is gone. no way to make prints now. having done cards and prints in the past, i would only do so now with careful consideration. they're spendy and time-consuming for the artist to have to deal with. you have to pay for professional scans, and usually when you order prints/cards/etc, you have to order a large volume. then you have to package, store, and market. that all cuts into your pocketbook and creating time. but i am glad you thought so much of that canvas :) happy new year! Congtatulations, Cathy! Looking forward to seeing what you creat with these clever stamps. Im so excited for you! What an honor!